View of “Yasue Maetake: Reverse Subterrestrial,” 2017. “Reverse Subterrestrial,” the title of Yasue Maetake’s exhibition here, suggests the dredging up of something buried. Indeed, her site-specific installation produces the strange sensation of plunging into the depths, even as you ascend the vertical space of the two-story structure. The artist’s immersive environment appears in states of both dissolution and becoming, conjuring postapocalyptic visions of slow but resolute regeneration. Maetake’s process is one of productive destruction: beating, boiling, and burning initiate physical transformations in materials that include steel, aluminum, fiber, tree bark, and animal bone. The resulting marks—stains, rust, and oxidation—create patinas and textures that evoke time’s passage, imbuing even the delicate handmade paper constructions with unexpected durability. The juxtaposition of industrial metals, often forming large structural apparatuses, with more organic accretions conjures the sense of a long-abandoned built environment. Although the forms remain abstract, they loosely reference flora and fauna. 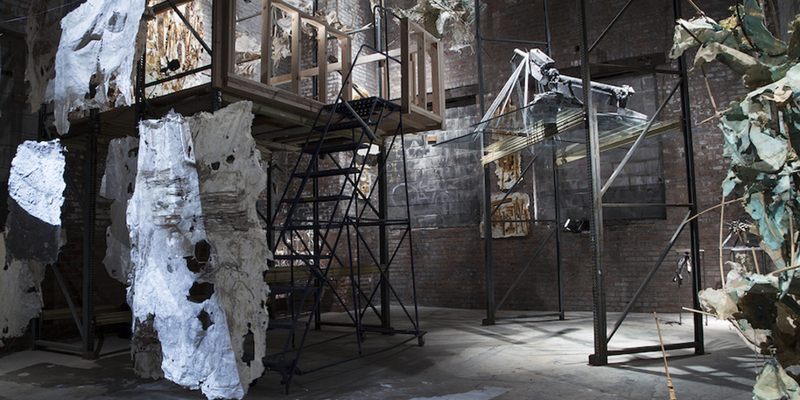 Molded paper-pulp sculptures, sometimes activated with videos projected onto their craggy surfaces, look like aquatic plant life, while sprawling limbs of aluminum and graphite could belong to giant insects. When the structures evince a human presence, it is through objects rather than bodies: Rusted impressions on the surfaces of fiber pulp appear to have been made by pressing tools into the wet material, suggesting once-useful implements turned obsolete. The “Three-Legged Idol” series, 2014–17, intimately scaled tripods of bone and bark adorned with trinkets and origami constructions, evokes talismans imbued with the desires and superstitions of their makers. But overall, “Reverse Subterrestrial” is a posthuman environ, picturing a time and place in which humans have wrought untold destruction yet new life forms proliferate.